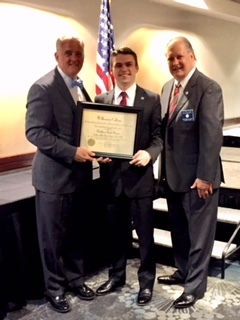 We recognize Matt Moore, CIC, CISR who graduated from Wilkerson College: North Carolina's College of Freemasonry. During the three weekend program, Matt learned about subjects dealing with lodge administration, symbolism, history, and charities. The class also toured the brick-and-mortar charities that NC Masonry supports: Whitestone: a Masonic & Eastern Star Community & The Masonic Home for Children at Oxford. "It was a great experience and I am grateful that I had the opportunity to attend", commented Matt. "I am looking forward to apply what I've learned at Wilkerson College to my lodges in Raleigh and Benson." Matt is Junior Deacon of The Lodge of the Nine Sisters, UD who he represented at the college. He is also Master of Relief Lodge no. 431, his home lodge in Benson.